Looking for short road trips from Hyderabad that can be done in a day? Here is a low down on places to visit near Hyderabad within 100 Kilometres. Indulge in a road trip and an adventure holiday all in one day for here are offbeat trekking destinations and beautiful camping spots just outside of the city that are just perfect for the coming winter weekends. Best Time to Visit | July – February. Anytime, but summers tend to be very hot. Bhoodan Pochampally, a cluster of villages an hours drive from Hyderabad, is where the famous Ikat weave comes from. The jagged triangles of the typical Ikat pattern is probably the most loved and recognisable of Indian textile patterns. So, head to Bhoodan Pochampally not just to shop directly from the cooperative but also for a glimpse into the village life of these Telangana weavers. Take the NH65 from Hyderabad to get to Bhoodan Pochampally. You can also take the Sagar Road. Best Time to Visit |October – February. Cooler months of winter. In Bhuvanagiri (which has now come to be Bhongir) stands a fort, aloof and proud, on a monolithic rock almost the size of a hill. Just getting to this 10th century fort involves scaling this rock, which is a climb of nearly three hours alternating over rough cut steps hewn into the stone and a bit of scampering about. Making Bhongir a hotspot for the adventure seekers of Hyderabad. Take the NH163 Hyderabad towards Nalgonda to get to Bhongir Fort. Of the few temples in India dedicated to the Goddess of Knowledge, Saraswati; two are to be found in Telangana itself. First of these being the ancient Gnana Saraswati Devi Temple in Basara. The second and newer one is in the town of Wargal in Siddipet. There is also a Veda Pathashala (School of Vedic Instruction) that resides here at the Vidya Saraswati Temple. The HIndu religious rite marking the start of a child’s formal education – Aksharabhyasam – drawing people from across the state to this temple. Take the Karimnagar-Hyderabad Highway via Shamirpet towards Siddipet, to reach Wargal from Hyderabad. Yadagirigutta is one of the most popular family weekend getaways from Hyderabad. Ask a Hyderabadi (locals from the city) for road trip ideas and Yadagirigutta would be the first suggestion you will hear. Its popularity comes from the temple on a hillock smack in the middle of this town in Nalgonda district. Built entirely in stone, the Sri Lakshmi Narasimha Swamy Temple is probably the only temple to have as its presiding deity, three different forms of Narasimha, an incarnation of Vishnu. Take the NH163 from Hyderabad via Bhongir to reach Yadagirigutta. 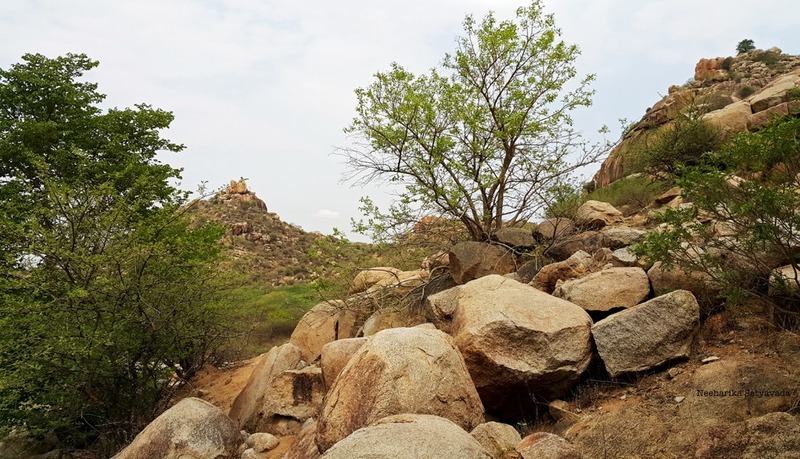 Bhongir – Yadagirigutta can be done together over a weekend with Yadagirigutta as the base or even Yadagirigutta – Kolanupaka. The Telangana Tourism run Haritha Hotel Yadagirigutta is a good place to stay. Once a significant centre of Jainism, Kolanupaka’s major draw is its endearingly beautiful Jain Temple that is over two thousand years old. The Manastambha of this temple has engraved into it inscriptions from the 1125 AD hinting at its past glory. There is also a Someswara Swamy Temple here from the Kakatiya Era, whose courtyard serves as a museum of ancient stone sculptures. Travellers Tip | The Kulpakji being a Svetambara Temple, it is advisable to dress in white if you plan to go inside the temple. Take the NH163 from Hyderabad and drive further beyond Bhongir and Yadagirigutta to get to Kolanupaka. Best Time to Visit | July – October. Monsoon for the greens. Hyderabad’s very own hill station (or as close to it as it gets), Ananthagiri Hills in Vikarabad is a lush green canopy of forests, clear fresh water streams and mist laden mornings. A popular spot for camping, star gazing, forest treks and bird watching, Ananthgiri Hills is the best possible weekend getaway from Hyderabad for nature lovers who love being outdoors. Take the ORR from Hyderabad and get on to the Chevella Road towards Vikarabad to get to Ananthagiri Hills. Ananthagiri Hills is a good place to even stay overnight and explore it over a weekend. There is a popular camping site run by Deccan Trails here and also the Haritha Valley View Resort run by Telangana Tourism. From crowded tourist landmarks to forgotten lakes and heritage discovery, there is more to Medak than meets the eye. While the Medak Church which is this district’s most popular landmark and Asia’s largest diocese is believed to be second only to the Vatican. There is also a fort, a lake and a wildlife sanctuary here with a deer breeding centre that allows visitors to drive through a four kilometre jungle trail to spot the Chital, Barasingha and the Sambar Deer. Take the NH44 from Hyderabad and at Kompally turn left to go via the Narsapur Forest Range – the scenic route – to Medak. One can do this trip over the weekend and stay the night at Medak Fort just for the experience of it. Telangana Tourism has their Haritha Heritage Hotel here in the fort. Best Time to Visit |July – February. Nalgonda Summers are sweltering. From the mysterious Chaaya Someswara Swamy Temple – that derives its name from the presence of a mysterious shadow, Chaaya – in Panagal to its lesser known Green Onyx twin; Nalgonda abounds in ancient temples, buddhist sites and sprawling forts almost in ruin. Just the place for those looking for offbeat weekend getaways from Hyderabad. Take the NH65 from Hyderabad to Narketpalli and then head right towards Nalgonda. Alternatively one can also take the Sagar Road.